These flower bookmarks look so lovely! It’s s easy to make a few as gorgeous and functional gifts or just for your books, if you’re an avid reader and read many books at the same time. Flower Bookmark by Annemaries Haakblog is a gorgeous little flower attached to a giant paperclip. 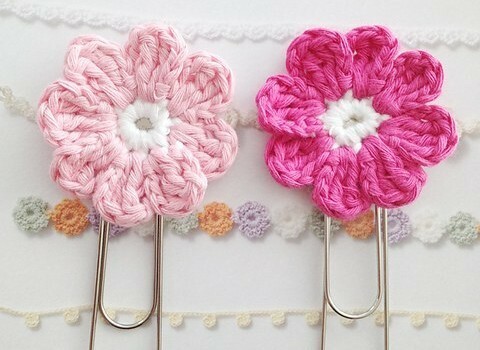 The flower pattern, however, can be used alone too, for headbands or other things you want to embellish. Crochet with Drops Paris or any other cotton that’s suitable for crochet hook 4mm. 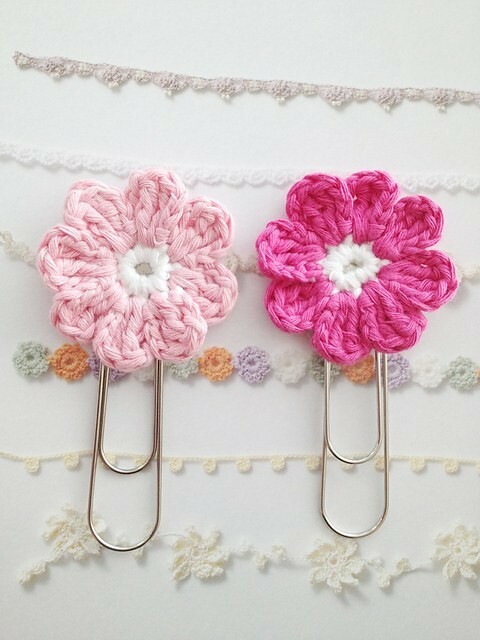 Ofcourse you can use smaller cotton, but then the flower will be smaller and it might not fit on the paperclip very well. Thanks to Annemaries Haakblog for the article inspiration and featured image. Really easy and so cute. Lots of things you can add this to. Not sure I would use a paper clip as it can leave an impression on the page. Rather have a long end of the yarn to go between the pages and the flower on top of the book.